Ken Ilgunas: No he din't! I got printed in Salon today. 1. My identity is revealed. 2. Duke knows about the van. Best of luck with whatever comes. One helluva social experiment. P.S. To a surgeon, that's funny because radiologists are forever circling the obvious. I think the circle is funny too! Well done on the article. What are the chances of Duke Administration reading that article? Maybe your show-down leading to white robes and tea will become of it soon. Congratulations Ken! Fucked or not, this is so exciting!! I'm curious why you chose a very expensive private uni over a public. Perhaps you could write an article on that from a frugal perspective. Cost/Benefit comparison? Not only have you opened yourself up to Duke security, but, even scarier, you've thrown yourself at the mercy of the salon.com trolls. Surgeon-- the experiment is far from over. Perhaps it's just entering a new phase. Appreciate the kind words. Anon- Duke admin finding out is 100%. No question about it. Anon-I chose an expensive private school because it wasn't that expensive for me. Typically it's $3000/course but they knocked it down to about $1000/course for me because of my destitution. Public school wouldn't have been any cheaper. Another good question might be: why didn't you just try to get your school paid for like most grad students? My answer: I tried this. I applied to 6 history phd programs and 4 MFA writing programs and got denied from all of them. And I'm glad I got denied. I'm better off in Liberal Studies, which keeps me from becoming "specialized" in something, which I wish to avoid like the plague. Mike--don't know what salon trolls are. There are quite a few critics out there though. Some have valid points, others just lack a sense of humor--which is really what this whole thing is all about. "Deep down, I think I wanted him to discover me. I wanted a showdown. I wanted to wave my arms at the dean and cry, "Impound my van? Over my dead body! I'll take you straight to the Supreme Court!" I can only ask, Why? Why "blow your cover" now, and not after graduation or not at all? What good can come of it? Cheers to you for pulling it off. Coming from an era of over spending in this country on all manners of things it is great to see the dedication to live without the confines of the great beasts of debt in order to get something truly of value. Great article! The comments are pretty critical, don't let them get you down. I'll be celebrating 6 years living in my van at the end of january, articles like yours are a step to ending negative stereotypes, I appreciate your way with words. All the best to you! ps I forget to say what an awesome vandwelling picture that is. One thousand words for sure! Have I mentioned, lately, that you're my hero? Did you choose the title of the article Ken? I get the feeling you didn't, and Salon.com chooses a title that just makes you sound like a bum. Anon-- Why blow my cover? What fun would it be if I kept it a secret all this time? Besides... there are plenty of ways to live radically. Perhaps I have something stranger in mind. Onion-- vandwellers unite! There ought to be many more of us. Kate-- the hero has a hero... Someday I'll be saying the same thing. Josh-- Ha, no. Salon picked the title. Mine was "Walden on Wheels: One student's attempt to afford the unaffordable." I didn't think it made me sound like a douche. It was catchy and probably made a lot of people read. Why are you so certain that the administration will find out? Are you sending them the URL? I'm trying to imagine something more radical than living on campus in your van. Not that I think living in a van is all that radical - just different for a student to do this. I think you have found a secret room in one of the campus buildings, maybe an unused janitorial store room, maybe something right outside the dean's office! I'm looking forward to the next chapter with eager anticipation. Anon--there is absolutely no way campus will not find out... Salon's a pretty big paper. Jim--don't really have a plan... but a few ideas if i need to adapt. Josh--no worries. I love writing this blog more than most anything. This is the sort of outside the box thinking that universities should be trying to encourage from their students. I think that is the argument you go with if you are brought in front of some board. Has anything changed since you published your article? Awesome haha, you and the guy from Early Retirement Extreme have finally given me the motivation to go back to blogging about my "mobile home" lifestyle (currently out of a hatchback lol). I know how cathartic it can be to get your thoughts out there when you spend so much time in your head, and frankly I need that. I'm in with anonymous, "Has anything changed since you published your article?" Anything else new/better in your life? CJ--cathartic yes. I'd go as far to say that I couldn't live without writing. Anons- Has anything changed? Well, yes, I suppose things have. Suddenly I'm semi-famous, which has been an incredibly strange process. I now have offers of book deals, interviews, radio shows, tv shows. This, again, is new and strange. Before the salon piece, maybe less than 100 people were acquainted with my secret via this blog. I'm satisfied with my "coming out" and I now see a new value in my experiment, acknowledging the 100s of people who've told me that they've been inspired by my little tale. But am I happier? Not really. Fame wasn't something I thought would have fostered happiness anyway. My semester is over and I'm not currently on campus so I didn't witness "the backlash." Despite the fame and opportunity for money-making, I'm still dead set on living radically. You could hand me a check for $1 million and I doubt I'd "upgrade" my style of housing. In other words, I believe what I write. Nice to hear you are such a strong believer in your writing. Too bad the fame didn't come accompanied by a woman! Don't worry van man, Duke students will rally to your cause! I'm a Duke student, and I already have. I just noticed the title. GREAT! I guess all that "circling the obvious" was get'n 'n da way of the hilarious! ...and I agree w/ a commenter on that link who said that if this spreads kids are going to totally abuse it and have schools cracking down regardless if it is a "radical" (common sense) lifestyle. Kinda similar to the anti-car living laws in parts of California. Ken, you have to post more than just every few days, now that this is main stream you are going to see some serious hits to your blog! Are you seeing an increase in traffic past your van? Tour buses driving by yet? 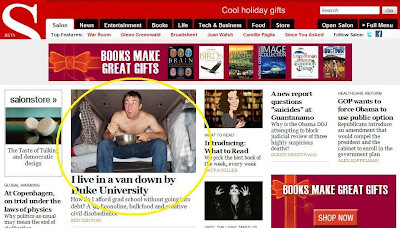 The Greensboro,NC Newspaper had a brief article about a student at Duke living in a van and I knew it had to be you. It quoted the University President stating that you were not breaking any University rules, but they were concerned for your safety. Damn that article blew up... if you google "Ken Ilgunas van" there's about 9 pages of actual results....usa today has a link to it as well. Allison--thanks. I had/have no idea how the student body would/will respond. Luke/CJ-- Thanks!--that was the first I heard of the link. Luke--I'm nowhere near Durham--I'm currently taking a wilderness first responder course in the NC mountains--the course came at a convenient time, allowing me to avoid the aftermath. I doubt I'll increase the frequency of blog entries--one a week is enough to keep me busy. In fact, I doubt this'll get too popular, given that few news sources even know about it. so any special "fans"...as in girls...? anon--haha, no. I have as many gay guys hitting on me as girls and that's just one a piece. ken, i'm so damn proud of you i don't even have words. seriously. i love reading your words and their radical honesty and cutting wit. i had no doubts of your potential to impact the world just by being you back when you were working through the beginnings of some of these ideas in the announcers booth/office over huge bowls of cereal with skvarka and i. way to make your impact an insanely positive one. good luck with all of the madness that's inevitable in your near future here. miss your face. Unidentifiable smell: identified. Or is it?